An absolute classic of Cuban poster design, this image by Rene Mederos is beautiful and very simple with only a few colours and very simple shapes to illustrate the young Cuban girl who plans to study to be a teacher. Working with silkscreen printing compelled the Cuban designers to use flat colours and simple shapes in their designs. And although this poster is offset printed it has the look of some of the best Cuban silkscreens. It was commissioned by Editora Politica. This simple and playful image by Alfredo Rostgaard uses the revolutionary fighter in three colours to represent the armed struggle for freedom among the three geographic areas represented by OSPAAAL (A, A, A = Asia, Africa and Latin America). The conference was designed to further the aims of a number of communist and socialist countries including Cuba, North Korea, Vietnam and was an annual event in Havana. 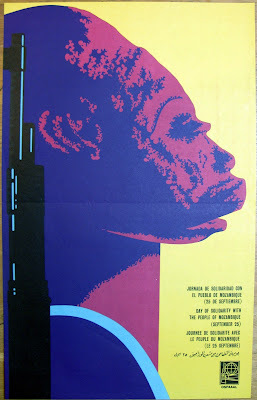 Here is a typically vibrant and interesting design from Jesus Forjans using an African doll like figure to represent the traditional, historical nature of Mozambique and the superimposed weapon to symbolise the armed revolution that was going on in 1969. 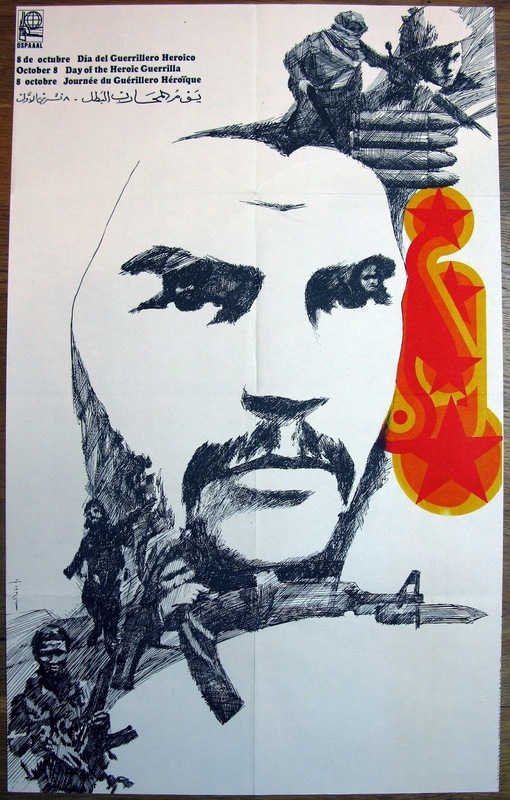 During the 60s and early 70s the country saw an uprising against the Portuguese colonial government by the guerrilla forces of the Mozambique Liberation Front, backed by communist and left leaning counties including Cuba. Typical of Cuban designs this poster is simple and colourful, using a national symbol to identify the country in terms of its local history in defiance of the ideology of the Portugese-led government of the time. Forjans has used an unusual cartoon-style method for separating the purple and blue colours using psychedelic floral motifs (detail below), something that is often seen on Cuban silkscreen posters of the time.